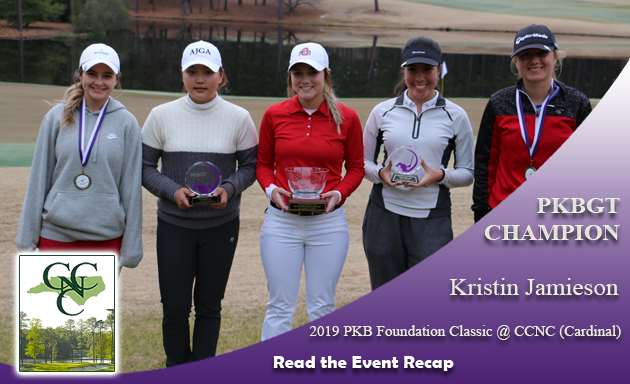 On Sunday, January 27, the Peggy Kirk Bell Girls’ Golf Tour completed the second and final round of the 2019 PKB Foundation Classic at Country Club of North Carolina (Cardinal) in Pinehurst, NC. Following a heated first day of competition, the air returned to a bitter cold as players arrived at check in just after 9 a.m. A blanket of frost covered the practice green once again, and the final round was set for an 11 a.m. shotgun start. Entering the round, Kristin Jamieson (Hillsboro, OH 2019) held a one-stroke lead over Melanie Walker (Burke, VA 2022), with three other players tied for third place, three strokes back in the Bell National Division. Lauren Denhard (Salisbury, NC 2019) and McKenzie Daffin (Fort Bragg, NC 2021) were in an identical situation, with Denhard one-stroke ahead of Daffin after the first round in the Futures National Division. For the second day in a row, as the tee time approached, players were shuttled out to their respective holes for the shotgun start. An exciting round of golf later, here is how the final leaderboard panned out. Coming out on top in the 25 player Bell National field was Kristin Jamieson (Hillsboro, OH 2019) with a two-day score of 76, 77 = 153 (+9). Jamieson, an Ohio State University commit, made a splash in the first PKBGT event of her career, taking home the 2019 PKB Foundation Classic championship bowl. Entering the day at the top of the leaderboard, Jamieson held off the rest of the field with a steady round, including a birdie on the ninth hole. Finishing just one stroke behind in second place was Yeon Joo Kim (Seoul, Republic of Korea 2019). Kim made a run on the back nine in her second round, beginning with a birdie on the hole 13, followed by five straight pars. Her two-day total score was 79, 75 = 154 (+10). Angelique Seymour (Fayeteville, NC 2019) finished the weekend with a two-day score of 79, 78 = 157 (+13), earning a third-place finish. Seymour kept her scorecard clean in the final round, including four straight pars on the first four holes. In fourth place with a two-day score of 77, 81 = 158 (+14) was Melanie Walker (Burke, VA 2022). Walker closed out her tournament on a high note, with a birdie on the final hole of her round. Macie Burcham (Greensboro, NC 2021) closed out the top five with a two-day score of 82, 78 = 160 (+16). Burcham came on in the back nine, shooting three birdies to help lead her to a fifth-place finish. Lauren Denhard (Salisbury, NC 2019) finished atop the 33 player Futures National field with a two-day score of 76, 82 = 158 (+14). Denhard, who heads to Belmont Abbey College next year, was able to ride first place the entire tournament, never relinquishing her lead from round one on Saturday. Grace Ridenour (Cary, NC 2025) made a run on Sunday, moving into a second place finish with a two-day score of 83, 80 = 163 (+19). Ridenour scored a strong front nine, including a birdie on the seventh hole. Winning a scorecard tie for third place, with a two-day score of 84, 82 = 166 (+22), was Emma Landis (Virginia Beach, VA 2020). Landis found her best success on the front nine of her final round with two birdies. Madison Messimer (Myrtle Beach, SC 2025) finished in fourth place with a two-day score of 84, 82 = 166 (+22). Messimer knocked two strokes off of her first round score on day two and topped it off with a birdie on the 14th hole. Rounding out the top five was Abby Hunter (Blacksburg, VA 2021), with a two-day score of 87, 80 = 167 (+23). Hunter’s final round performance cut seven strokes off of her day one performance and boosted her into position to receive a medal. We would like to thank all of the staff at the Country Club of North Carolina for their incredible hospitality this weekend as the host course. Additionally, we would like to thank all of the participants and parents for your patience and understanding through both of the weather delays. The PKBGT is back in action on February 9-10 for the Orange Whip Classic at the Walker Course at Clemson University presented by Orange Whip Golf!